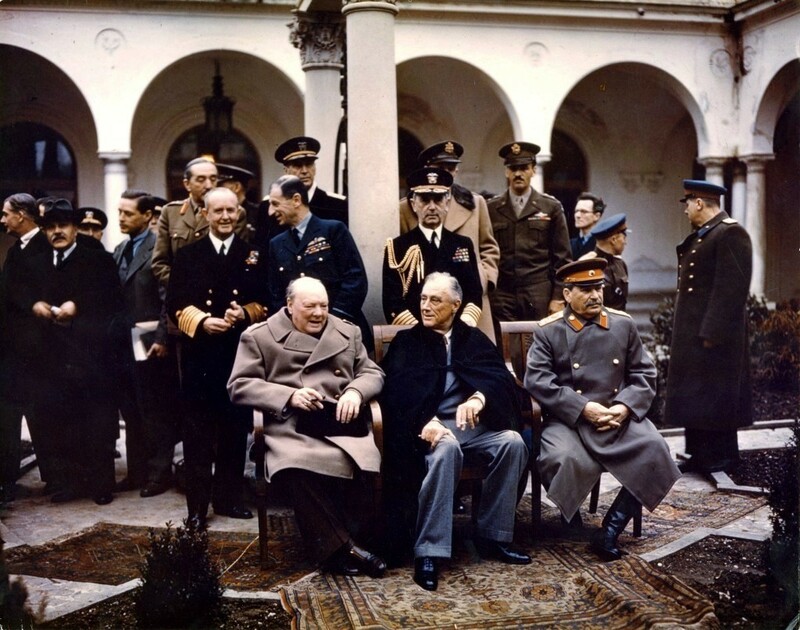 The “Big Three” at Yalta. Seated, left to right: British Prime Minister Winston S. Churchill, President Franklin D. Roosevelt, and Soviet Premier Joseph Stalin and their staffs at the Argonaut Conference in February 1945. Image courtesy of Joint Chiefs of Staff. The U.S. Department of Defense Joint Chiefs of Staff History Office recently released a series of eBooks focusing on the Inter-Allied conferences held during World War II. The conferences documented within this series were led by senior military leaders from the United States and Great Britain working in concert to make vitally important decisions for the combined WWII effort during the period of uncertainty facing Allied Forces in both the European and Asian conflicts. Download for free this series of eBooks detailing the inner-workings of these historic conferences from the U.S. Government Bookstore. Here are a few examples in the series. The Arcadia Conference: December 1941–January 1942. Two weeks after the United States entered World War II, the Arcadia Conference (also known as the First Washington Conference) was held in Washington, DC, from December 24, 1941 to January 14, 1942. Working together President Franklin D. Roosevelt and Prime Minister Winston S. Churchill made the initial crucial decisions for the combined war effort at this important meeting. One of these established the Combined Chiefs of Staff, comprising the high-ranking officers who would become the US Joint Chiefs of Staff and their British counterparts. It was this consultative body of top military leaders that would refine the Allied military strategy and approve all significant military decisions for the duration of conflict. The most consequential decision reached at Arcadia was that of “Germany first,” making the defeat of Germany the prime Allied objective. Additionally, plans to invade North Africa, which would come to fruition in November 1942 with Operation Torch, were extensively studied and discussed. The Post-Arcadia Conference: January–May 1942. Only nine days after the Arcadia Conference (also known as the First Washington Conference) was held in Washington, DC, the Combined Chiefs of Staff (CCS) again convened for a series of twenty meetings between January 23 and May 19, 1942. During these meetings, the CCS focused on the situation in the Southwest Pacific area known as the American-British-Dutch-Australian (ABDA) area, which included Burma; support of Chinese Nationalist leader Chiang Kai-Shek; and the possibility of a German attack on England. 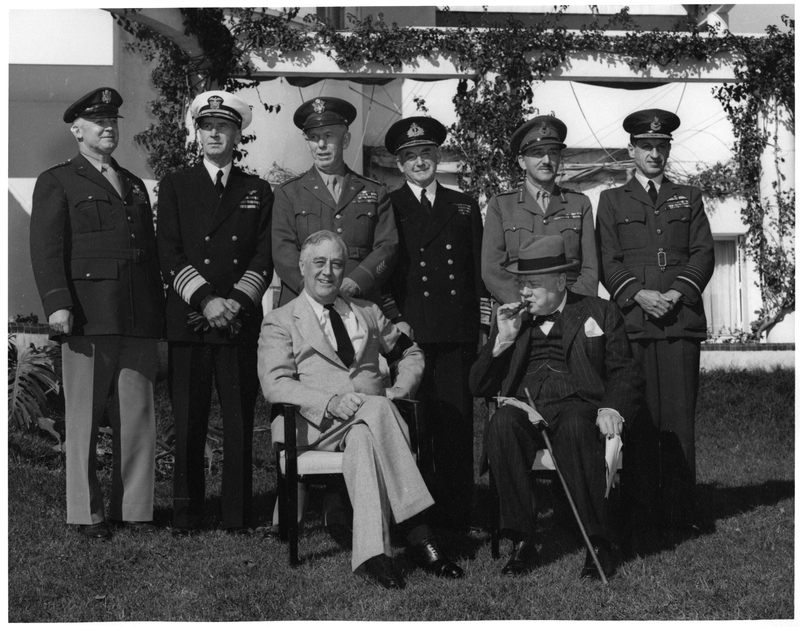 Seated: President Franklin D. Roosevelt (left) and British Prime Minister Winston S. Churchill with the Combined Chiefs of Staff at the Casablanca Conference on January 22, 1943. Image courtesy of Joint Chiefs of Staff. The Casablanca Conference: January 1943. During the first month of 1943, President Franklin D. Roosevelt and British Prime Minister Winston S. Churchill met at the Anfa Hotel in Casablanca in French Morocco for a ten-day conference to plan the next stages of the war against the Axis. Accompanied by the French generals Charles de Gaulle and Henri Giraud, the two leaders and the Combined Chiefs of Staff mapped out the grand strategy for both the European and the Pacific theaters. Interested in learning more about these and other WWII Inter-Allied conferences? Visit the U.S. Government Online Bookstore to download the entire series here. About the author: Blogger contributor Trudy Hawkins is a Marketing and Promotions Specialist in GPO’s Publication and Information Sales program office. This entry was posted on Thursday, February 1st, 2018 at 5:39 pm and is filed under Department of Defense, ebooks, Military History, World War II. You can follow any responses to this entry through the RSS 2.0 feed. You can leave a response, or trackback from your own site.